5.4 Multiplicity and "Field Significance"
Statistical Methods in the Atmospheric Sciences, Third Edition, explains the latest statistical methods used to describe, analyze, test, and forecast atmospheric data. This revised and expanded text is intended to help students understand and communicate what their data sets have to say, or to make sense of the scientific literature in meteorology, climatology, and related disciplines. In this new edition, what was a single chapter on multivariate statistics has been expanded to a full six chapters on this important topic. Other chapters have also been revised and cover exploratory data analysis, probability distributions, hypothesis testing, statistical weather forecasting, forecast verification, and time series analysis. There is now an expanded treatment of resampling tests and key analysis techniques, an updated discussion on ensemble forecasting, and a detailed chapter on forecast verification. In addition, the book includes new sections on maximum likelihood and on statistical simulation and contains current references to original research. Students will benefit from pedagogical features including worked examples, end-of-chapter exercises with separate solutions, and numerous illustrations and equations. 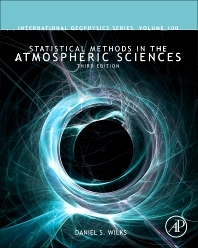 This book will be of interest to researchers and students in the atmospheric sciences, including meteorology, climatology, and other geophysical disciplines.